Taking Solow Seriously - Does Neoclassical Steady State Growth Really Exist? Discussions of the population problem have always had the capacity to stir up public sentiment much more than most other problems....In fact, the discussion of the population problem seems at all times and in all places to be more strongly dominated by the volitional elements of political ideals and interests than any other part of the established body of social and economic thinking. Here, as in perhaps no other branch of social theorizing, the wish is very often father to the thought. Gunnar Myrdal, The Godkin Lectures, 1939. All theory depends on assumptions which are not quite true. That is what makes it theory. The art of successful theorizing is to make the inevitable simplifying assumptions in such a way that the final results are not very sensitive.' A "crucial" assumption is one on which the conclusions do depend sensitively, and it is important that crucial assumptions be reasonably realistic. When the results of a theory seem to flow specifically from a special crucial assumption, then if the assumption is dubious, the results are suspect. As everyone who has ever thought about economic processes and social development is only too well aware, the last two centuries have been characterised above all by extremely rapid increases in living standards in a number of countries (generally known as the developed, or "advanced" economies), and this phenomenon, which is more or lest unprecedented in the whole of human history has given rise to extensive debate, together with a most voluminous quantity of literature, about what exactly the factors are which lie behind what this modern growth phenomenon. The objective of what follows is not to offer a general evaluation or even an overview of the corpus of work which has come to be collectively known as "growth theory", but rather to attempt go straight to the heart of the issue, and following in the most venerable footsteps of Federal Reserve Chairman Ben Bernanke, try to take Solow seriously, or at least try to take one of his crucial assumptions (one of the ones which intuition suggests might be plausible if "not quite" true) in order to examine just to what extent this assumption still appears "reasonable" in terms of fitting the facts as we now know them (rather than the facts as Solow could, in his day, see them), or if you prefer, to try to see if what may have been nearly "true" at the time Solow wrote his pathbreaking paper still remains so, on any reasonable interpretation of the meaning of the word "true". What we will here investigate is whether or not it is a reasonable starting point for growth theory to postulate ( in order, as it were, to start the ball of analysis rolling) that modern economies may move towards some sort of steady state growth rate (even if only as a theoretical construct), and whether indeed such and idea forms a useful concept with which to try to explore and model the growth process which characterises modern "mature" economies. We will investigate this assumption, in good Popperian fashion by examining the assumption in terms of the validity of what is conventionally considered to be one of the key predictions which may be extracted from its use of this in neoclassical growth models of the Solow type. But before going any farther, what exactly is steady-state growth? If we are to decide whether such a crucial assumption is indeed realistic or not, we first need to get a handle on what it is, since reading through the literature which surrounds the topic, you might be forgiven for saying that it wasn't exactly clear. In order to help us ease us into the problem, one useful place to start might be start with an examination some of what Nicolas Kaldor would have termed the "stylised facts" of the situation. As is well known, on any generally accepted measure the process of wealth creation in the developed world has been a massive and extensive one over the last couple of centuries. According to most estimates GDP per capita in the United states is at least ten times higher today than it was 125 years ago, and if we allow for a growth mismeasurement (underestimate) of only one percentage point per year, the factor in question could easily be more than thirtyfold (Brad DeLong, 1998, see reference at foot of this post). Equally remarkable is the relatively brief time span (when compared with the entirety of human history) during which this rapid growth has occurred. 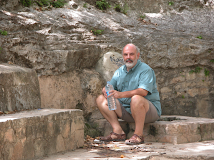 Since we normally assume humans to have been distinguishable from other primates for at least a million years, it is possibly surprising to find that it was not until the agricultural revolution - some 10,000 or so years ago - that the long march to the modern era really beagan, and even more to the point, that it has only been during the last two hundred years or so that we have been able to find that steady and continuous increase in economic growth which so characterises our era and which we so tend to take for granted. In fact the average GDP per capita growth rate in the United States has been estimated at something in the region of 1.8 percent per year since the start of the 19th century. However such growth has been far from uniform, and it normally used to be thought that (aside from some special periods like the 1930's, or the Solow "computers everywhere except in the productivity numbers" 1970s and 1980s) as the years have passed there has been a general acceleration in growth capacity. Perhaps the most recent, and most famous, exposition of this view is to be found in the 1990's sustainable growth acceleration postulated by Sir Alan Greenspan, and perhaps the most noteworthy questioning of this view has come from Paul Krugman who asks the not entirely unreasonable question about, if what we have had in the United States since the late 1990s has been a "twin" internet and construction bubble, how much of that "accelerated" growth was real, and how much was simply the product of unsustainably bringing forward consumption (Krugman, 2008). Evidently this is an empirical question for later growth accounting researchers, but we might like to note in passing that the present crisis does at least leave open the possibility that the "growth acceleration" which has followed the Solow slowdown may not be quite the acceleration we used to think it was. However, even allowing for the volatile periods, and the exaggerations, there is considerable evidence to support the existence of some sort of ongoing long term acceleration in US growth, at least during large parts of the twentieth century. 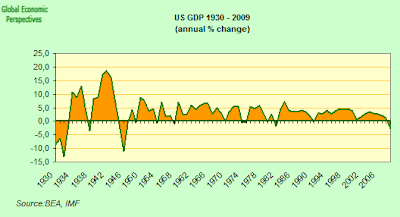 Using data taken from Angus Maddison (1995), Charles Jones (2002) estimated that the growth rate of the US economy between 1950 to 1994 was an annual 1.95 percent, which was slightly higher than the rate he derived for 1870 to 1929, which was 1.75 percent. Even these these highly aggregated numbers conceal a considerable degree of variance, since the growth rate registered in the 1950’s and 1960’s - 2.20 percent - was considerably higher than that found during the Solow productivity slowdown of the 1970s and 80s, which was a "mere" 1.74 percent. Be all this as it may, the existence of such aparent stability in U.S. growth rates over such a long period of time has given considerable support to the "common sense" and conventionally view accepted view that the U.S. economy is, and has been, running at close to what is considered to be some sort of long-run steady-state (or balanced growth) path, as can be seen in the charts below. GDP growth is of course always volatile, but when you strip out some of the volatility the smoothness of the US path really is quite remarkable, making it hardly surprising that many US economists have found the idea of steady state growth a fairly plausible one. 1. Per capita output grows over time, and its growth rate does not tend to diminish. 2. Physical capital per worker grows over time. 3. The rate of return to capital is nearly constant. 4. The ratio of physical capital to output is nearly constant. 5. The shares of labor and physical capital in national income are nearly constant. 6. The growth rate of output per worker differs substantially across countries. Now it is not my intention here to examine each of the above "facts"in turn, but rather address a much more specific question, one which essentially focuses on the first presumed constant on the list. What I wish to examine is whether it is indeed the case that per capita output grows continuously over time, and further, that its growth rate does not tend to diminish. To be more explicit, I do not wish in any way to question the view that US economic growth has been not only constant, and even possibly accelerating slightly, rather what I would like to do is ask whether this characteristic is shared by all (or even a majority of) the advanced economies, and if it is not, to move on to ask why it may be that this seeming property of US growth is not a shared one, and indeed what the implication is for a theory whuch takes the existence of such a state as one of its critical assumptions. In order to carry out this rather straightforward exercise I would like to return to the founding father of modern neoclassical growth theory (Solow) and ask one very simple question: is Solow's "critical" steady state growth assumption "realistic", or put another way, does it appear as realistic today (given what we now know) as it did at the time he made it. And if it isn't, I would like to ask what the implications of coming to realise this are for how we think about modern growth. The core of the problem here lies in the decision Solow took in setting up his model to consider both rates of saving and population growth as exogenous variables (ones which are determined outside his model). The rate of growth of any economy in the longer run is simply determined by the rates of growth of the labour and capital inputs which are themselves assumed to grow at a constant rate. And once that steady state growth rate is achieved any external perturbation which sends the economy off its growth path will only have a temporary (or transitional) impact before the homeostatic mechanisms which are assumed to be at work send the economy back on course. In more conventional language, once the equilibrium growth rate is achieved, it should be stable, since regardless the initial value of the capital-labor ratio, the system will develop toward a state of balanced growth at the steady state rate. The system can adjust to any given rate of growth of the labor force, and eventually approach a state of steady proportional expansion. At one point in his paper Solow does examine whether the model could be applied to a case where population movement was endogenous rather than exogenous. His conclusion was that it could, but the explanation he offers is indeed interesting. Instead of treating the relative rate of population increase as a constant, we can more classically make it an endogenous variable of the system. Suppose, for example, that for very low levels of income per head or the real wage population tends to decrease; for higher levels of income it begins to increase; and that for still higher levels of income the rate of population growth levels off and starts to decline. What Solow postulates here is a kind of U shaped function, part of which roughly corresponds to what we could call the "Malthusian era" when population levels fluctuated as real wages (or income per head fluctuated), and part of which offers a first approximation to the modern growth era, in the sense that fertility (and hence population levels) tends to decline as income rises. But between these two fertility "regimes" there would seem to be a clear break, since what has not been observed (anywhere) is that as incomes fall back subsequent to the transition from one regime to another then fertility rises. Normally we find (in post Malthusian population environments) that as living standards fall, even in the longer run fertility also itself tends to fall. Eastern Europe following the end of communism would be one clear example of this. The point here, however, is not to enter into any kind of extended discussion of the factors which influence fertility (and thus population movements), but rather to point out that they do not seem to follow the kind of straightforward function which Solow imagined, and that this difficulty will confront any kind of growth model (whether population is exogenous or endogenous) which postulates the idea of steady state growth, since the kind of homeostatic corrective mechanisms (which would lead an economy back to some kind of equilibrium growth rate) to not appear to be in operation. 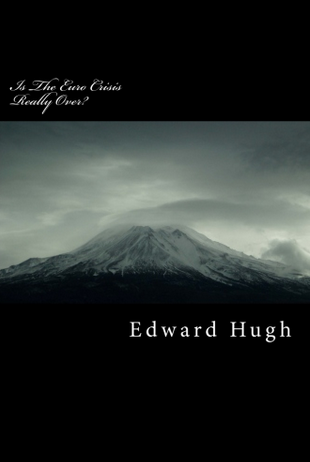 Returning however to the substantive issue, what I would like to ask is whether in fact the assumptions of exogenous savings and population growth, and constant steady state growth are as plausible as they seemed to Solow? What if both population growth and saving rates were both more plausibly to be considered as endogenous variables (ones which are influenced by the working of the process itself), what would this do to the foundations of neo-classical growth theory? And indeed if movements in population size and age structure are found to exert a significant and non-stochastic influence on key growth variables (that is are found not to be mere random shocks) then what really is the current serviceability of a model that assumed them to be so? This is a question we should at least be prepared to ask ourselves, and in particular we need to ask it since most our contemporary forecasting models (and indeed even the core of real business cycle theory on which many of them are based) are constructed on at least some sort of loose assumption that neoclassical growth theory is itself a well-grounded and solid edifice. Of course, and touching for a moment some of my conclusions before I even present them, there could be a number of reasons why Kaldor's first "fact" may not be a fact, and one of these, evidently, could be that the modern growth epoch is just that, modern (rather than post-modern) and an epoch. That is, the period Kaldor was referring to may be a historically bounded one, with a begining and an end, and Kaldor's facts may fit the empirical reality which typified that particular period (when per capita output grew at a constant of even increasing rate), but not the period which it now seems might be the posterior one, the post modern-growth era, when per capita output grows at a declining (and even possibly negative) rate. If this were to be the case it would, of course, fit quite well with the pessimistic mindset of many pre-Solow growth theorists, who although they held assumptions which were in many ways similar to Solow, felt that a process of diminishing returns would eventually grind down output growth (see, for example, Jones, 2001). What both Solow and his immediate predecessors (Harrod, Domar etc) had in common was the assumption of stable and growing populations, with more or less constant age structures (the demographic transition in age structures being thought to have belonged to the pre modern-growth period), and what we now know (that they didn't) is that such assumptions are unrealistic as we move forward across a century where populations will start to age and decline in one country after another, with radical implications not just for labour force size, but also for age structure and the shape of the population pyramid. So to put all this another way, what I seek to do here is ask one very simple question, and this is whether there are still sufficiently good empirical reasons for continuing to believe that there is such a thing as a long term steady state trend growth rate for economies whose population size and structure is changing rapidly and constantly. This state of affairs is already a current reality for a number of limit societies (Japan, Germany and Italy would be the obvious "stylised" examples, but many East European countries are already hazardously near the point of entering the group) while for most other advanced economies it still remains only a theoretical possibility, although it is one which, given the demographic data and forecasts we have to hand, we can hardly afford to ignore. So instead of making the kind of assumptions about population change and economic growth which form the basis of the Solow neo classical theory, is it more "reasonable" to assume that growth rates tend to fluctuate over time following a more or less orderly pattern of rise and decline, and - putting the issue even more stridently - should we not be asking ourselves whether it may it not in fact be the case that growth rates fluctuate as the age structure of a population steadily moves across the whole sweep of the demographic transition - from a state of ultra-high to one of ultra-low fertility. Or, if you prefer, could all of this simply be a non-linear process in the classic and most straightforward sense of the term? In attempting to assess the validity of the "crucial assumptions" which underlie neo-classical growth theory we would do well to keep Kaldor's stylised facts in the forefront of our minds, and in particular ask ourselves how it could possibly be that - in those societies where fertility has now fallen to well below replacement level and labour forces look set to decline and decline - the shares of labour and capital in gross national output could be expected to remain more or less constant. After all, doesn't standard theory tell us that as labour supply comes under greater pressure, wages should rise and technical change should occur? But - and I offer this as simply a throw-away point a this juncture - in the most affected economies like Japan and Germany this does not seem to be what has been happening, since due to recent labour market reforms labour force growth has resumed (after stagnating or falling back) as more and more people in the older age groups have either been reabsorbed or have continued to work, but the value added by the additional work performed does seem to have tended to decline. Put another way, even as employment levels have risen and labour markets tightened in these two countries, the level of real wages has not budged, and on some readings may even have fallen. Balanced Growth Or Transitional Dynamics? As Charles Jones points out something funny is evidently going on here, since even in the best case scenario socities growth rates have not performed as Kaldor would have lead us to expect. Even in the case of the US economy some of the core processes we have been observing for some 50 years or more now seem to contradict what we would expect to happen on the conventional account. For example, time spent accumulating skills through formal education - which we could think of as some form or other of human-capital investment - has increased substantially over the last half century. In 1940, less than 25 percent of adults in the United States had completed high school, while only about 5 percent had completed four or more years of college education. By 1993, more than 80 percent had completed high school, and more than 20 percent had completed at least four years of college. In the second place, the search for new ideas has intensified, and as a result an increasing fraction of the United States workforce - and indeed of workforces throughout the OECD - is now composed of scientists and engineers engaged in research and development. In 1950 the fraction of the US labour force engaged in such work was in the region of 0.25 percent. By 1993, this fraction had increased threefold to more than 0.75 percent. Now the point here is, as Jones is only too willing to point out, on the assumptions of virtually any of the standard growth models, both these changes should lead to long-run increases in rates of per capita GDP growth, yet (despite the "acceleration" debate) such anticipated increases have not been observed. Under standard neoclassical models, changes like the ones Jones mentions should generate what are known transition dynamics in the short run and “level effects” in the long run. Put simply the growth rate of an economy should rise temporarily (during the transition, the "transition" effects) and then return to its original (steady state) value, while the income level of the population should remain permanently higher as a result (the "level effect"). On the other hand, under assumptions which are typical of endogenous (new) growth models, such changes should lead to permanent increases in the growth rate itself. However, as we have noted above, the growth rate of U.S. per capita GDP has been surprisingly stable over the last 125 years with the level of per capita GDP being reasonably well represented by a simple time trend. So what is going on here? One distinction which may help get address the problem is the one Jones himself makes between a constant and a balanced growth path. Along both such paths, growth rates remain constant over an extended period of time, but in the former case constant growth is simply the (coincidental) by-product of a process which is effectively driven by series of transition dynamics while in the latter what is involved is stable and self correcting since what we have is a steady state. Now one possibility (discussed by Jones) is that the apparent steady state growth exhibited by the US economy over so many decades has been associated with a very complex set of transitional dynamics, dynamics which "just happen" to have produced this particular outcome. But if this were the case then one very natural question arises. If a large part of U.S. growth in recent years has been associated with transition dynamics, then why do we not see the traditional signature of a transition path, e.g., a gradual decline in growth rates to their steady-state level? 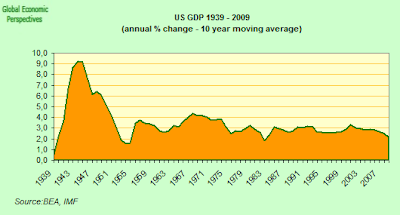 Why is it that U.S. growth rates over the last century or more appear to be so stable? So we might like to consider one further possibility at this point. Could it be that the "as a matter of empirical fact" transition dynamics associated with the various factors of production in the United States have worked in some strange way to precisely offset one another, and in so doing leave the growth rate of output per worker fairly constant? We will return to this issue below, but since it is an explanation which may not be so easy to discount as many may imagine it to be at first glance, we now need to make a short detour and - in order to examine one of the factors which may be involved - take a more general look at some empirical data concerning the interaction between population dynamics and economic growth. Now obviously national economies differ from one another in a large number of ways, but one of these is the population structure and its underlying dynamic. 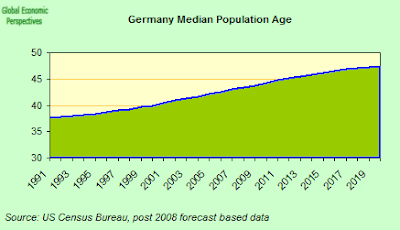 One reasonably concrete starting point for addressing the issue of population age structure and whether it has an impact on economic performance could be via a comparison of GDP growth rates and population change in a number of the countries most immediately affected by ageing population dynamics. 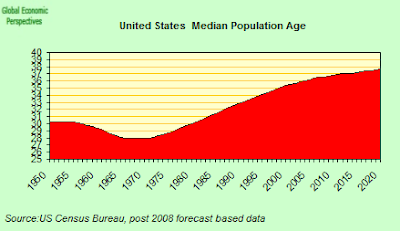 It is interesting to examine the dynamics of more "elderly" societies (in terms of population median ages) since the growth process in "younger" ones (ie those in earlier stages of their demographic transition) have been reasonably well studied under the rubric of what has come to be known as the "demographic dividend" (Bloom et al, 2003). Simply put the demographic dividend idea suggests that as birth rates decline from previous high levels of fertility, and the age structure of a population changes so that a higher proportion are to be found in the working ages, economies experience a "growth spurt", or a period of what is often termed catch-up growth. This pattern, under the neo-classical view would constitute some form or other of transition dynamic. So the presence of a transition is not in doubt, what is really in question is whether the process settles down in to some form of ultimate steady state. Now, as we have already noted, it is a key postulate of neo-classical growth theory that each economy has its own long run steady state growth rate. 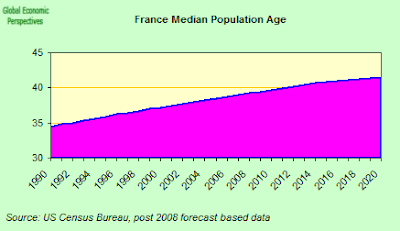 One of the consequences of making this sort of initial assumption (albeit as a purely hypothetical and theoretical one) is not in fact that hard to see, since the steady state assumption would seem to imply that as the demographic transition which produced those earlier "transitional dynamics" is left steadily behind (the demographic transition remember is associated with large fluctuations in levels and growth rates of population) then a steady growth rate in the labour force (achieved in part via institutional efficiencies in the labour market) and a supply of savings regulated by effective monetary and interest rate policy, should mean that any given economy would have its own given balanced growth rate, irrespective of key population variables like fertility rates and life expectancy. This neo-classical long run steady state growth rate needs, of course, to be understood as a theoretical postulate, a sort of ideal limit case, but nevertheless the concept continues to orient and inform a good deal of conventional economic thinking about economic growth. It also informs the way most people conceptualise and approach the present global economic crisis, since underlying one rescue and stimulus package after another is the idea that there is a long term trend growth rate out there somewhere, just waiting to be "recovered". So the idea of "trend growth" far deeper roots than are normally taken into account in the simple Solow-derived offshoots of neo-classical theory, and indeed seems to form part of some kind of collective "ideal type" folk wisdom which are deeply embedded in the mindset when it comes to thinking about business cycles and growth prospects (in some form or another such assumptions normally enter the thinking of the Real Business Cycle tradition, to name but one example) . Thus the growth rate which people normally anticipate will be "recovered" following a recession is normally derived from a model based on some version or other of a long run steady state (or constant equilibrium path). The question we are left with though is really, does the idea of convergence to steady state growth constitute one of those suppositions which are assumed - in Solow's words - to be nearly true, and what are the consequences for the theoretical edifice of modern macro economics if the idea turns out to be not quite as "nearly true" as was previously thought to be the case. Linear Or Non-linear Growth Patterns? The idea of steady state growth is also often closely associated with the idea of that changes in the long run rate of growth are largely determined exogenously to the economic system, and this idea is typically associated with the Solow model of economic growth, since here long-run economic growth is seen as being determined by such exogenous factors as technical change, aggregate saving rates, schooling rates, and the rate of growth of the labor force. Indeed this is the issue which largely attracted the attention of the new (or endogenous) growth theorists, since it seemed to run against certain basic economic intuitions that this should be the case, although, as Solow argued in his reply to some of the critics, things are by no means as simple as they seem in this context, and most of the newer generation of models have run into what seem to be insoluable difficulties due to certain key, "knife edge" assumptions they need to make (Solow, 1994). This paper takes Robert Solow seriously. In his classic 1956 article Solow proposed that we begin the study of economic growth by assuming a standard neoclassical production function with decreasing returns to capital. Taking the rates of saving and population growth as exogenous, he showed that these two variables determine the steady-state level of income per capita. Because saving and population growth rates vary across countries, different countries reach different steady states. Solow's model gives simple testable predictions about how these variables influence the steady-state level of income. The higher the rate of saving, the richer the country. The higher the rate of population growth, the poorer the country. The first thing to notice about the argument is that the Solow model clearly predicts two pretty straightforward and neatly linear relations: more population-less growth, and more saving-more growth. Now, we are immediately presented with an important difficulty here since, as we will see below, there is now a considerable and accumulating body of empirical evidence which seems to suggest that among "mature" developed economies, those who have the fastest rates of population growth are also those who experience the highest rates of per capita income growth (the United States is the most obvious example, but as we will see this is also the case of France and the United Kingdom), while in those countries where population momentum has slowed, even to the point where their populations may now decline (Italy, Japan, Germany, for example) do not seem able to achieve their former high rates of economic growth, and, even worse, seem to be losing ground in per capita income terms with those economies whose populations continue to grow reasonably rapidly. Now I do not seek here to explore this question in all its intricate detail, I simply wish to make one clear and central point, and that is that the relations involved between population growth and per capita income growth do not seem to be simple linear ones, and arguably it is this property which has thrown many previous researchers off track since in running growth correlations they have normally tended to treat them as if they were. Indeed the whole idea that economies tend to converge towards some sort of balanced growth path is a highly questionable one which, with the notable exception (as I suggest above) of the US, seems to enjoy fairly limited empirical support over the longer term. Economic performance, it seems, tends to fluctuate, but the big question we have in front of us is: do such fluctuations conform to any kind of identifiable pattern? Arguably they do. To start with one very simple example, let's take a look at the Japanese case. Below you will find a graph of Japanese economic growth from 1955 to the present prepared using statistics made available by the Japanese statistics office. What is obvious from looking at this profile is that Japanese growth has been far from uniform over the last 50 years or so. And indeed far from converging to a steady state growth rate, Japans growth seems to have peaked in the 50s and 60s, and have been steadily reducing ever since. Arguably, after peaking, there may be a trend there, but this trend would seem to be towards ever lower annual rates of economic growth. And there is no evidence at this point to justify the supposition of a steady state rate - or hypothetical "homeostatic fulcrum" - around which Japanese growth would stabilise and fluctuate. As far as can be seen at present the process of decline is secular and ongoing. To be clear, the argument is not that Japanese GDP growth does not exhibit some sort of trend, arguably it does, the argument is that this trend does not conform to our current conception of a balanced growth path, and indeed is not homeostatic, in the sense that there is no self correcting mechanism, hence the trend may well be one of gradually declining (and eventually negative) growth with no end point in sight. Put like this the prospect is evidently rather alarming, but I can see no other reasonable and responsible way of putting it. Nor is Japan a unique case, a reasonably similar pattern can be observed if we come to look at long term growth rates for the Italian economy. Again, Italian growth seems to have peaked, and then entered decline. In Italy's case the peak seems to have been in the 1970s (but it may have been earlier, since I don't at this point have data for the pre 1970 period), and indeed since 1990 Italian GDP growth has only managed an average of something like 1.4% growth per annum, while as far as we can see at the present time, over the decade from 2001 to 2010 it may well turn out (depending on the depth and duration of the present recession) that Italian GDP may well have been nearly stationary. Curiously enough, in this neoclassical speculation on population the factor of age distribution was for a long time not studied, and it was never studied intensively as to its economic implications. It is remarkable, because this factor could to a large extent be taken care of in a stationary model of theory. When a certain trend of the population development is maintained for such a long period that a stable age distribution has been reached, the difference between a progressive, a stationary, and a regressive population -- apart from a different development of population numbers -- is that in the first more than in the second, and in the second more than in the third, the number of children is relatively large and the number of old people relatively small. A corresponding difference rules even within each major age group taken by itself. If we thus compare a regressive population with a stationary one, we find that in the first young children are relatively fewer than older ones and that the center of gravity is also higher in middle age as well as in old age.Now people in different ages are productive in different degrees, and -- within a given standard of living -- their consumptive demands, their cost of living, also differ. Here intensive empirical studies ought to set in...........to ascertain the average productivity and the cost of living in different age groups. Gunnar Myrdal, Godkin Lectures, Lecture Six, 1939. So why exactly is it that national growth rates rise to a peak, and then seemingly steadily peter-out again. Well the explanation - while it may prove to be a little disagreeable - should not actually be so surprising if we start to think about economic theory a little. In fact I am far from being the first researcher to have raised this issue, since as early as the 1930s the Swedish Economics Nobel Gunnar Myrdal was raising what are essentially similar issues, and was struggling, just as I am now, to make sense of the neo-classical growth assumptions in just the same way as I am now. What Myrdal argued so cogently (see quote above), in a series of lectures which have unfortunately been long neglected, was that existing neo-classical theory appears to be severely limited when it comes to its capacity either to explain the ongoing changes in age structure which have now become so evident, or to incorporate the impact of such changes into its general theoretical structure. Essentially, on whichever type of growth model you use, the key to the problem of long term movements in levels of GDP per capita is no great mystery, it is a function of two parameters: a)the proportions of the total population who are working, and; b) the kinds of activities they are engaged in. If we look, for example, at the early section of the above graphs showing GDP for Japan and Italy it is not hard to see that these economies exhibited very high growth rates during their "take off" point (a phenomenon which we can also find today in emerging economies like China and India ). 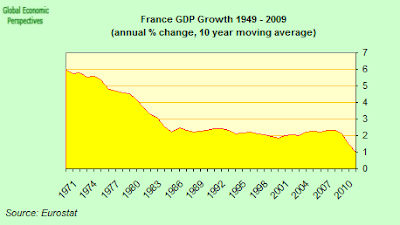 Such "strong" growth rates are basically the result of two factors, a rapid increase in the proportion of the total population who become involved in economically productive activity, and the process of technological 'catching up' which takes place as these economies move ever closer to the "state of the art" technological frontier and thus engage in activities with ever higher components of value added. Since emerging economies start at some considerable distance from this frontier then evidently the growth rates they achieve can be extremely rapid as they close the gap, and this would almost certainly be one form of what is known as "conditional convergence", as techological levels and institutional structures become more uniform. But there is another dimension to growth, and in this sense societies almost certainly do not converge (except possibly over the very, very long term, where we might postulate that all societies could converge to a similar - and very high - median age, although even this theoretical idea would need to be treated with some caution, since so many features of this situation may ultimately turn out to be "path dependent"). This second dimesion revolves around age structure related productivity and consumption patterns. The thinking behind the idea I am presenting here would run as follows. In a first moment, emerging economies take off due to a rapid process of input accumulation (Krugman, Asian Tigers), and the resulting growth is simply a result of "more" rather than of "more productivity", as ever higher proportions of the population are economically active in support of total output. I take it as self evident that under such circumstances growth in output per capita has a natural tendency to rise. However, with the passage of time, this intial "input accumulation" driven growth wave starts to slow. Fortunately, under "normal" circumstances this loss of momentum is largely offset as emerging economies move up the value chain (sectoral shifts). These sectoral shifts are also accompanied by a steady upward movement through the median age brackets as the impact of lower fertility and higher life expectancy makes its presence felt. Not only do these movements produce more workers, they also produce more experienced and better educated ones - as the impact of learning by doing and increased investments in education come to be noted. Also we see a rising proportion of what have come to be known as 'prime age workers' active in the economy. The exact definition of who exactly such prime age workers are may be something of a moveable feast, and in any event the variable needs to be empirically determined for any given society at any moment in time. Essentially prime age workers are those whose productive activity is at its lifetime maximum. Evidently the higher proportion of such workers who are present in any given economy the higher the aggregate output of that society is likely to be, and in this sense there must be a maximum point here. But the essential idea being advanced here is that this maximum is not attained and then sustained, but rather reaches a peak, before the proportion subsequently starts to decline. This phenomenon should be one of the principal reasons why we might consider the idea of "steady state growth" to be, prima facie, a rather implausible one. 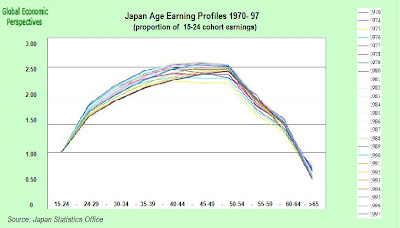 The prime age wage/productivity effect can be seen in the chart below which shows how the age related earnings structure has altered in Japan over the years between 1970 and 1997 (the chart was prepared by Wolfgang Lutz, see Lutz et al 2005). Now one very significant and revealing detail to be noted above, is the fact that while the shape of the hump has changed slightly over the years there has been little noticeable drift to the right, which is what we would expect to see were the extension of life expectancy to be associated with an upward movement in peak performance ages. The absence of such drift should alert us to the possible existence of an age-related productivity problem in high population median age societies and again constitutes some sort of prima facie evidence that there is at least a phenomenon here worthy of investigation, even for those working in the ethereal world of neo-classical tradition where there is no good reason why long term growth rates should be subject to such fluctuations. Of course, I making here the generally accepted assumption that wage levels bear some statistically significant relation to productive output levels (ie wages can serve us here as a proxy for something, if they can't, and in the longer run, then it would be hard to see why we are talking about neo-classical economics at all). What can be easily seen from the chart is that Japanese wages generally peak somewhere in the 50-54 age range, even though many workers in Japan currently continue to work to 75, while multilateral organisations like the OECD and the World Bank (see "From Red To Grey", for example) continue to rather simplistically offer higher participation rates in the over 55 age groups (and extended working lives generally) as a sufficient condition to offset the inevitable decline in numbers in the traditional working age groups. Far from wishing to claim that such a policy will not help, I merely wish to draw attention to the possibility that things may be more complex than many assume, and also to highlight the theoretical implications of this undoubted empirical reality. A good deal of the argumentation in this essay is based on the experience of only three countries: Germany, Japan and Italy. This is not simply a coincidence, or a question of random selection, since these three are the highest median age societies on the planet at the present time. In this sense, if we wish to advance conjectures about what the impact of population ageing may be on growth the three of them do offer us a somewhat special opportunity. 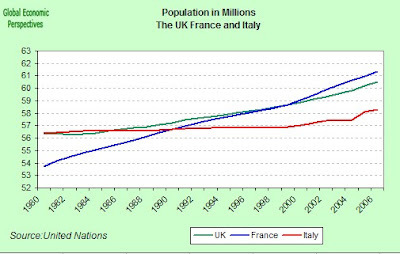 As we have seen, in both the cases of Japan and Italy, growth has tended to rise to a peak and then steadily decline as the population has aged. Japan has, through very strong export competitiveness maintained some degree of positive economic resilience up to this point - although the 2009 economic collapse has to raise serious issues about the longer term sustainability of such a high level of export dependence. The same cannot be said of Italy, which due to its much weaker competitiveness profile cannot expect the export vibrance that a Japan (or a Germany) can attain. 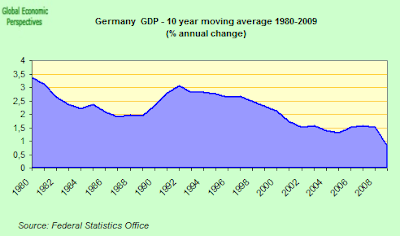 Measured in terms of gross domestic product changes at 1995 prices, the rates of economic growth in the former territory of the Federal Republic of Germany and - since 1991 - in Germany have continuously declined since 1970. While the average annual change was 2.8% between 1970 and 1980, it amounted to 2.6% between 1980 and 1991 and to 1.5% between 1991 and 2001. 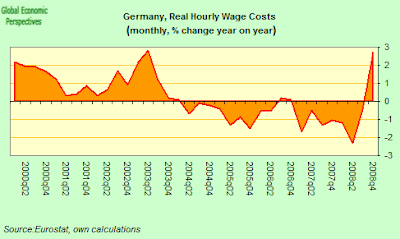 Since 2001 the performance of the German economy has in fact been worse rather than better, much to the consternation of those who hoped that many years of sacrifice in the form of wage deflation and structural reform would lead to a rebirth of the country's former economic prowess. 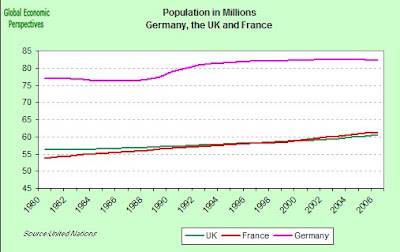 In reality the German economy shrank (0.2%) in 2003, and grew by only around 1% in both 2004 and 2005. And while the German economy picked up notably in 2006 and 2007 (with growth rates of 3.2% and 2.6% respectively) and many talking in terms of such grandiose notions as global uncoupling and "Goldilocks" type sustainable recoveries, the most striking feature of the recent German dynamic has been the way that internal demand failed to respond to the externally driven export stimulus. Of course, all the speculation came to an abrupt end in 2008 when the German economy once more entered recession as world trade expansion slowed and exports collapsed (with GDP only growing by 1% over the year), while 2009 looks set to be a lot worse (with the IMF currently forecasting a contraction somewhere in the region of 5%, and forecasts of up to minus 7% not seeming exaggerated). So some part of the traditional mechanism of economic transmission seems to have been broken, a phenomenon which has lead Claus Vistesen (using rather traditional Keynesian terminology) to talk about "engine failure" rather than mere magneto problems (Vistesen, 2009). 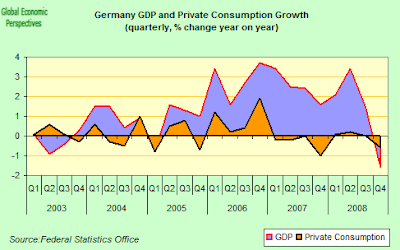 Long term GDP growth rates in the German economy are clearly falling, and the decline looks clearly set to continue. But let us return now to our central concern here, which is Solow's critical expectation that as population growth rates decline economic growth rates should increase. And in order to do this let us look at some more charts. This time the charts are based on data prepared by Eurostat, and show the volume index of GDP per capita as expressed in Purchasing Power Standards (PPS) (with the European Union - EU-27 - average set at 100). A reading on the index of a country over 100 implies that the country's level of GDP per head is higher than the EU average and vice versa, and relative movements in the indexes imply that the rates of change in GDP per capita are either improving more or less rapidly than the EU average. The basic data behind the charts is expressed in PPS which effectively become a common currency eliminating differences in price levels between countries making possible meaningful volume comparisons of relative GDP per capita. Since the index is calculated using PPS figures and expressed with respect to EU27 = 100, it is only valid for cross-country comparison purposes and not for individual country inter-temporal comparisons, nonetheless these charts are extraordinarily revealing. 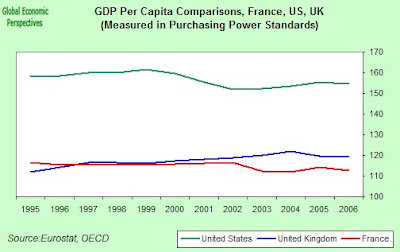 As can be seen in the above chart for the period 1995 to 2006, comparative US PPS per capita GDP, after correcting somewhat post 2000, as the value of the dollar fell vis-a-vis the euro and the pound sterling, maintained a reasonably steady path, while UK comparative per capita GDP rose, and the French dropped (in both cases comparatively slightly). 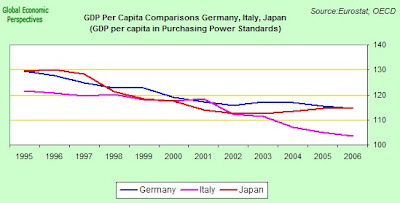 When we come to look at Italy, Germany and Japan, a very different profile is evident. All three have steadily been losing ground vis a vis the EU 27 average benchmark. Now evidently the classification process I have used here is far from being an arbitrary one. The first chart shows a relatively high-population-growth (near replacement fertility) group of countries, while the second shows a low-to-declining-population growth (lowest-low fertility) group. In each case the economies in question are developed ones, and, as it happens, all are members of the G7. As we can see, in PER CAPITA income growth terms all three of the former hold their comparative position much better than all (or any) of the latter three. 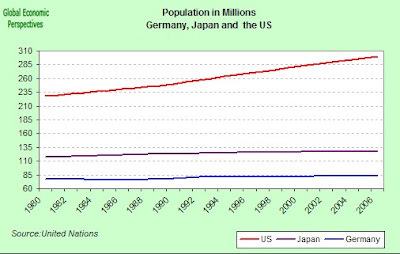 When we come to look at population growth (see the three comparative charts below, which are only classified for visual convenience according to population size), we find that in all three members of the former group of countries (the US, the UK and France) population is rising, and sharply so, while in the latter group (Germany, Japan and Italy) population levels are virtually stationary (with the slight uptick in Italian population in the 2004 - 2006 period being entirely due to the rapid regularisation of a large irregular migrant population). Prime facie then, all of this is in conflict with what Solow would have expected, but then Solow never started to think about movements in age structure, and rising median population ages, which is hardly surprising since he was thinking about the problem as he saw it over half a century ago. The reason why we should be seeing this difference is not that hard to get at, given all that has been said above, since the UK, France and the US are all ageing much less rapidly than Germany, Japan and Italy. This comparative measure is interesting, I would argue, since while - for the sort of catch-up growth reasons I touched on earlier - it is hardly surprising that developed economies should lose their relative standing vis-a-vis some key emerging ones (conditional convergence), it should raise more than the occassional eyebrow to find that one group of countries among the more established economies should be losing impetus in comparison with another group, and all the more so if we are prepared to entertain the possibility that this difference is reasonably correlated with both population growth and rates of ageing in a way which seems to go right to the heart of some of the most basic predictions of traditional (consensus) neo classical growth theory. Basically, simple visual inspection of some basic charts hardly counts as strong evidence for anything, especially when we are talking about accepting or rejecting some of the most highly prized (and most generally common sense accepted) core components of our modern economic edifice. But as has so often been found to be the case in the history of scientific thinking, common sense expectation and securely grounded scientific reality are surely not necessarily co-extensive, and when a few easily produced charts can apparently throw so much sand into the highly tuned and greased works of mainstream growth theory, then there should at least be cause for thought, reflection and further research. On a first pass interpretation I think I would wish to claim to have made some sort of case that population median age does seem to matter, and, even worse for the predictions of standard neo-classical theory, rising population is not necessarily a negative factor for economic growth. As already mentioned, at the present time Germany, Japan and Italy leading the global rising median age charge, but many more countries are soon destined to move up along the trail they are blazing. By median age the next in line are basically Finland (41), Slovenia (41), Sweden (41), Austria (41), Belgium (41), Bulgaria (41) Greece (41), Croatia (41) and Switzerland (40). And the presence of names like Slovenia, Bulgaria and Croatia should really be ringing alarm bells here, since these three belong to a group of countries who have been marked by a very special political and social history, and as such have experienced a very special economic and demographic transition, one which means, if the kind of rising-median-age loss-of-economic-thrust case presented here has any validity, then we may be facing a the first batch of what may becoming a growing band of countries who share the common feature that they grow old before they grow rich. Now, and going back to where we started, Mankiw, Romer, and Weil (MRW, 1992) carried out an empirical evaluation of a textbook Solow growth model using a multicountry data set for the years 1960-1985 and found support for the Solow model's predictions that, in the long-run steady state, the level of real output per worker by country should be positively correlated with the saving rate and negatively correlated with the rate of labor-force growth. 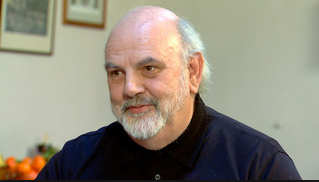 Interestingly Bernanke and Gurkaynak (in their examination of their work) suggest that MRW's basic estimation framework is broadly consistent with almost any growth model that admits a balanced growth path, and adds that this category includes virtually all extant growth models in the literature. In which case, one could argue argue that MRW do not only address the Solow model, in the sense of distinguishing it from possible alternative models of economic growth, but addresses the whole corpus of growth literature, since it almost without exception assumes the potential property of a balanced growth path. As Bernanke and Gurkaynak say, there are two and only two possibilities here: either the long-run growth rate is the same for all countries (that is, g(i) = g for all i), as maintained (following Solow) by MRW, or it isn't. Even more to the point, "explaining" growth by assuming that growth rates differ exogenously (or for factors which lie outside the model) across countries is not particularly helpful, especially since such changes in the growth rate seem to be systematic and not incidental. Once it is allowed that long-run growth rates not only differ across countries, but that growth processes in individual countries often do not exhibit properties which are normally associated with a balanced growth path ( that all variables do not grow at constant geometric rates, for example) then we are naturally pushed to consider explanations for these differences, and towards a fresh approach in our models. Making evident the need for this consideration is all I can reasonably hope to have achieved in this short essay. As someone once said, at least knowing what it is you don't know is one step beyond knowing nothing. Bernanke Ben S. and Refet S. Gurkaynak, "Is Growth Exogenous? Taking Mankiw, Romer, and Weil Seriously," NBER Macroeconomics Annual, Vol. 16. (2001), pp. 11-57. Bloom, David, David Canning and Jaypee Sevilla, "The Demographic Dividend, A New Perspective on the Economic Consequences of Population Change", Rand, 2003. DeLong, J. Bradford, “Estimating World GDP, One Million B.C. - Present,” December 1998. U.C. Berkeley mimeo. Jones, Charles I, "Was an Industrial Revolution Inevitable? Economic Growth Over the Very Long Run" Advances in Macroeconomics (2001) Volume 1, Number 2, Article 1. Kaldor, Nicholas, “Capital Accumulation and Economic Growth,” in F.A. Lutz and D.C. Hague, eds., The Theory of Capital, St. Martins Press, 1961. 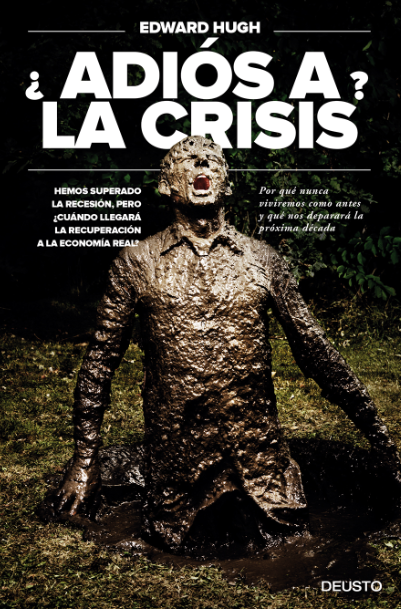 Krugman, Paul, "The Return Of Depression Economics And The Crisis Of 2008", W. W. Norton, 2008. Lutz, Wolfgang, Vegard Skirbekk and Rosa Maria Testa, "The Low fertility trap hypothesis", presentation at the Postponement of Childbearing in Europe Conference, held at the Vienna Institute of Demography, December 2005. Mankiw, N. Gregory, David Romer, and David N. Weil, “A Contribution to the Empirics of Economic Growth”, Quarterly Journal of Economics, 107, May 1992, 407-37. Solow, R. M. (1956). A contribution to the theory of economic growth. Quarterly Journal of Economics 70(February):65-94. Solow, Robert M. (1994). Perspectives on growth theory. Journal of Economic Perspectives, Winter 1994, 45-54. Vistesen, Claus, Japan - Engine Failure? 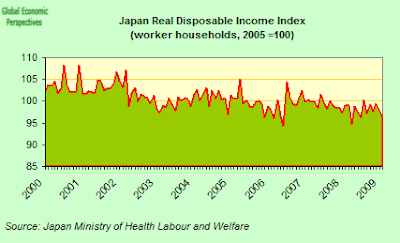 Japan Economy Watch Blog, March 2009. World Bank, From Red to Gray - The "Third Transition" of Aging Populations in Eastern Europe and the Former Soviet Union, 2008. Young, Alwyn, "The Tyranny of Numbers: Confronting the Statistical Realities of the East Asian Growth Experience," Quarterly Journal of Economics, 110, August 1995, 641-80. One way to close the system would be to add a demand-for-labor equation: marginal physical productivity of labor equals real wage rate; and a supply-of-labor equation. The latter could take the general form of making labor supply a function of the real wage, or more classically of putting the real wage equal to a conventional subsistence level. In any case there would be three equations in the three unknowns K, L, real wage. Instead we proceed more in the spirit of the Harrod model. As a result of exogenous population growth the labor force increases at a constant relative rate n. In the absence of technological change n is Harrod's natural rate of growth. (Solow, 1956). Once we know the time path of capital stock and that of the labor force, we can compute from the production function the corresponding time path of real output. If the capital-labor ratio r* should ever be established, it will be maintained, and capital and labor will grow thenceforward in proportion.......Thus the equilibrium value r* is stable. Whatever the initial value of the capital-labor ratio, the system will develop toward a state of balanced growth at the natural rate. If the initial capital stock is below the equilibrium ratio, capital and output will grow at a faster pace than the labor force until the equilibrium ratio is approached. If the initial ratio is above the equilibrium value, capital and output will grow more slowly than the labor force. The growth of output is always intermediate between those of labor and capital. The basic conclusion of this analysis is that, when production takes place under the usual neoclassical conditions of variable proportions and constant returns to scale, no simple opposition between natural and warranted rates of growth is possible. There may not be -in fact in the case of the Cobb-Douglas function there never can be -any knife-edge. The system can adjust to any given rate of growth of the labor force, and eventually approach a state of steady proportional expansion. In general one would want to make the supply of labor a function of the real wage rate and time (since the labor force is growing). We have made the special assumption that L = Lo, i.e., that the labor-supply curve is completely inelastic with respect to the real wage and shifts to the right with the size of the labor force. We could generalize this somewhat by assuming that whatever the size of the labor force the proportion offered depends on the real wage. Up to now, whatever else has been happening in the model there has always been growth of both labor force and capital stock. The growth of the labor force was exogenously given, while growth in the capital stock was inevitable because the savings ratio was taken as an absolute constant. As long as real inc.ome was positive, positive net capital formation must result. This rules out the possibility of a Ricardo-Mill stationary state, and suggests the experiment of letting the rate of saving depend on the yield of capital. If savings can fall to zero when income is positive, it becomes possible for net investment to cease and for the capital stock, at least, to become stationary. There will still be growth of the labor force, however; it would take us too far afield to go wholly classical with a theory of popu1:ition growth and a fixed supply of land. "Economists hitherto have tried far too hard to change the world, the point however is to understand it. " "In a world where expectations are (nearly) everything, changing our understanding is already to change reality. Not only that, it is the most plausible, most cost effective and least destructive way to do so"
"And Santiago Rosinyol sat himself lazily down at the top of Las Ramblas. A small sign propped awkwardly against his left foot read " three ideas of mine for one of yours". Unfortunately that day there were no takers, nor the next one, nor the one after that. The people thought there was some kind of catch. Finally, and exhausted, Rosinyol folded his chair, ripped up the sign, and went wearily on his way. " 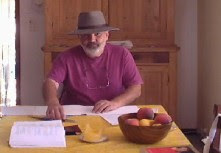 Well I'm fifty nine, I live in Barcelona and I have three children - a boy (Morgan) and two girls (Sara and Andrea). If I were pinned down in a corner and had for once to say what I was - as opposed to who I am - I suppose I would say I was an 'economist', although this is a destiny that most of the people who know me well would say I had spent the better part of my life trying to avoid. Filling in that little box which asks "how would you describe yourself (maximum 50 words)" has always being something of a problem for me. In fact I have the feeling that as soon as someone tries to put a label on me I am already trying to escape from it. Perhaps the best commendation to my work was made by my old school headmaster who, in one of those endless termly reports, got right to the heart of things: 'is he trying to prove that any fool can miss a bus?' He was definitely right, I seem to have spent the best part of half a century becoming a specialist in missing busses. To add insult to injury, I was once described by my Departmental Professor as a 'thief' for accepting my doctoral grant while continuing to spend my time reading the books and attending the courses that I chose to read and that I chose to attend, the ones that I thought were interesting. In a way I am still doing this, reading what interests me, and writing about what attracts my attention. I think I suffer from what was once called 'an excess of curiousity', the kind that kills cats, you know. The scholastics even regarded this as the nearest thing to an intellectual sin. Philosophy is born of wonder, but an excess of it was thought to be fatal. I do take some consolation, however, in the thought that in an age where internet connectivity puts the generalist back in business, and bigtime, then the optimal level of healthy curiousity per cubic centimetre of neuronal mass may have just risen with it, and excessive curiosity might well now not be the 'vice' it was considered to be in an earlier age. At least, this is how I square things with myself. The humanist psychologist Erich Fromm wrote quiite a lot about 'Having and Being'. I'm definitely on the 'being' side of thinks (indeed I just gave away the last of what used to consitute a lifelong collection of books. Don't worry, they were all found good homes, it's just that I don't believe in leaving things around to accumulate dust). Sartre on the other hand indulged himself with the exploration of the boundaries between being and doing. Again he was (existentially speaking) much more on the 'doing' side of things, (as was his writer friend Albert Camus). But there is doing and doing. The last time I was asked what it was I 'did', I replied rather cantankerously, that I don't do, I think. I mention this here since I suppose, tucked away in that response, somewhere there lies a feeling, possibly even a prejudice, which more or less sums me up. It runs something like this: if more economists spent more time really thinking about what economic systems are, and exploraing audacious hypotheses about how they might work, and how they might relate to other systems which interact with them like the climatic or biological reproductive ones, and less time tinkering around with what appear to be me to be ever more ontologically promiscuous models, models which often have a somewhat dubious connections with the real functioning of that all too real economic system we encounter in our leveryday lives, well I think that if we did that we might (just might), as a profession, make a better 'all round' job of anticipating some of the problems out there in the real world before they actually make their presence only too obvious. (For examples of what I mean, just browse around some of the issues raised on this website, the euro, ageing and low fertility, deflation in Japan etc, etc). Now I know there is a tried and tested Hegelian premise to the effect that the owl minerva only flies after dusk, but do we really have to be so complacent that we take this proposition at fully face value and in a prostrate posture? Einstein, I feel, had it right, keep your explanation simple, but no simpler than the complexity of the problem you have in hand necessitates. (Six centuries earlier, Occam had, of course, had a very similar thought). My big (as in biiiiig) bet is that one or two simple parameters can explain more about the whole economic development process than we are conventionally prepared to admit. Pride of place here I would give, of course, to our biological reality, our fertility and our life expectancy, to how these change and to how the changes impact on population age distribution and structure, on performance and on productivity. Much of the rest of our secondary economic epi-phenomena - savings, investment, aggregate demand, interest rates, balance of payments, inflation, productivity - can, I conjecture, be better understood once this fairly basic 'ground-point' has been established. Alfred Marshall had it right, economics has more to do with biology than ever it has to do with physics. Going back to the practical end of things for a moment, and unwinding history a little by turning realism on its head for a change, I would say - as I indicate in the initial quote at the top of this page - that economists have hitherto been overly obsessed with trying to change the world, and insufficiently so with trying to understandi it!. If as we never cease to tell ourselves expectations matter, then what matters most isn't how things are, but how we perceive them to be. "John Maynard Keynes was pretty generally regarded as an extremist"
"I have sown dragons, but harvested fleas"
"Economists set themselves too easy, too useless a task if in tempestuous seasons they can only tell us that when the storm is long past, the ocean is flat again"
(Tract on Monetary Reform p80). I do not consider myself a Keynesian, yet I admire his life and his work enormously. I consider myself a Keynesian in the spirit of Keynes, not the letter. The times have changed and so have the problems, both theoretically and practically. Keynes' problem was war, how to pay for it, and how to escape from the consequences of the indebtedness which comes with it. Our problems are different. They stem principally from our changing demography, and are issues like how to maintain our elderly populations free from penury in the longer run, how to handle the resource supply issues which accompany the rapid economic growth of some of the most populous countries of the world, and how to deal with the climatic impacts of the previous two processes, are the big items on our agenda. However even if the problems may be very different, sometimes the economic dynamics are unnervingly similar: increasing population, like increasing military activity, tends to be inflationary, at least in an industrialised society. Population decline, and paying-off war debts tend, on the other hand, to be deflationary. But perhaps here the comparisons begin and end. We are a new generation and we have new problems. Perhaps the old labels no longer really help. For me the job of the economist, like that of any other scientist, is to try to understand. Paraphrasing a statement from Robert Lucas about economic growth, and appropriating it to my own circumstances: scarcely a day goes by when I don't think about the changing population structure of the planet, and what it means for us all. I live and work in Barcelona, the capital of Catalonia. Barcelona is a city with a long history and a diverse cultural heritage, which means that here we all speak at least two languages: Catalan and Spanish. Barcelona is, was and always has been a city of tremendous immigration, and with the migration it has always been a dynamic city, a city of cultural change. Across the twentieth century these migration processes have marked Catalonia's history like little else (with the obvious exception of the civil war and the subsequent Franco dictatorship). The start of the century itself saw Barcelona as the vanguard city of a new Spain, with workers arriving from across the whole country to build the new metro system (Spain's first), and to erect the site for Spain's international Industrial Exhibition, which again, not coincidentally, was held in here. In the 1950's and 60's many more migrants came - in particular from Andalusia and Extremadura - to work in the new, rapidly developing, industries which characterised the end of the Franco era. Today the migrants come from every farflung corner of this diverse planet, but they have one aim in common, to make their future in this wonderful city. This unprecedented recent migratory wave - Catalonia's population has grown from 6 to 7 million in just five years - is now, once more, making Barcelona the most culturally diverse and the most creatively dynamic city in modern Spain. So it is fitting that I too who am, like my father before me, and his father before him, a migrant, should come here, to one of the migration capitals of modern Europe. Over the the years that I have been here - 16 to date - It is has become abundantly clear to me that immigration played an important part in Barcelona's history long before the arrival of the most recent and obvious waves. Whether you look to the early Phoenicians and Greeks, the later Romans to the arrival of the Converso Jews, fleeing persecution at the end of the middle ages, or to the migrants from France who came in the late 14th century, in this case fleeing to escape the plague, or if you turn your attention to the great internal Spanish migrations of the second half of the 20th century. One common thread remains clear: the singularity and evident prosperity of Barcelona and Catalonia has been in large part due to the singular combination of the hard-working and business-like mentality of the original Catalan inhibatants of this green and pleasant land and the the constant and steady flow of new and eager workers and citizens. This is the secret of the success, and yes, at a time when the seach for 'viable models' is rampant, it is something which I think it would be well worthwhile exporting. Why am I doing these all this internet stuff that is. (More fundamental questions will have to be answered elswhere). The conventional answer would probably be that I hadn't got anything better to do at the time. But I'm sure my friends and family would remind me that that isn't true. Another very good explanation would be that running a blog and updating website pages helps you to order your thoughts, to classify and not lose your ideas. Again, you can share your discoveries - this is a little more difficult since first of all you have to locate the people who might be interested in them, or better said, they have to locate you, but perhaps this amounts to the same thing in the long run. Deep down I suppose I'm doing this because I've rather stupidly convinced myself that I've got something to say. In particular you'll probably notice I tend to get rather excited about the way the population structure of our planet is in the process of changing. I also happen to hold the opinion that the history of our species is one of continuous migration (right from the very earliest days of our origins African origins). This reality feels rather strange since we tend to think of ourselves as sedentary, spending our time as we do establishing tribes, comunities, nations etc. What we actually do best and most is move, adapt and change. Perhaps this is another example of the lack of conformity between our self-image and our reality. In any event the recent patterns of global migration are not new, they are the continuation of processes that go way, way back. Our identities are changing, and one of my objectives here will be to try and chronicle how this is happening. The bottom line is that these two phenomena, demographic change and global migration are probably going to have important, and undoubtedly unexpected, consequences, and I'm going to try to follow and record them here, on my website and thorugh my weblog. In my childhood days - I grew up in the UK of the nineteen-fiftees, in the grimy northern and decidedly unromantic city of Liverpool - there was an establishment TV commentator - Richard Dimbelby - who was always wheeled out to talk us through the things which were then thought to be important, and no matter what the occasion there he was (in fact two of his sons seem to have pretty successfully carried on the family tradition). I have always retained my youthful admiration for the masterful and dignified way he did what he did (even though my feelings about the events being commented-on has undoubtedly changed with the changing of the years). So maybe that's my real ambition in doing all this, to be a sort of Dimbelby voice-over for the process, the self-conscious part of consciousness or whatever. (If I said just plain and simple that I was here to be a witness that would sound rather religious which it isn't meant to be, so let's just wind this up by saying that I like the thought of all this going to its eternal destiny in the hard drives of Brewster Kahle's Wayback Machine). Finally I can't escape without saying something about my dear friends the bonobos. First of all what the hell are bonobos? Well in case you didn't know, bonobos and chimpanzees are our closest relatives in the animal kingdom, and bonobo's are, in fact, genetically closer to us than chimpanzees. If you don't know much about them you can find lots of information about bonobos at The Bonobo Conservation Initiative. You can also inform yourself there about the fact that BONOBOS ARE IN DANGER due to the fact that the last remaining populations are to be found in central Africa (in the Democratic Republic of the Congo) in an area of war and conflict. It is especially ironic that the last remaining members of a pacific and affectionate species should be endangered in this way by their human cousins. I was first 'turned on' to Bonobos by the work of Richard Wrangham. An interesting interview with Wrangham can be found here, and a good introduction to the life and mores of bonobos can be found in this article from Scientific American by Frans de Waal (one of the first to seriously study bonobos). The esential and obvious point is that bonobos are really a metaphor, a metaphor based above all in the fact that they resolve conflicts through affection, and not, as is all too often the case with their chimpanzee and human kin, through the use of tribal violence and aggression. Incidentally another thing humans have in common with chimps is territoriality, so the next time you hear someone slagging off a newcomer from some distant shore, just remember THIS BEHAVIOUR HAS BIOLOGICAL MORE THAN CULTURAL ORIGINS. Oh, we are so, so sophistocated. I'm still not decided whether this, following Nietzsche is 'human all too human', or following Eudald Carbonell, is rather 'human, not yet sufficiently human'. Be that as it may I canot help but share the hope of Norbert Elias that there is somewhere here a Civilizing Process is at work, or, as I prefer to call it, a domestication process.